Andrew Abrams, also known as Agent Andy, coached a very talented artist, from time to time, over a ten-year period. Career direction strategies; freelance artist fees; art and concept licensing; and deal making were important topics of discussion. The artist, who is known by the name Raine™, made a presentation to Willitts Designs, Ltd., a well-known collectibles manufacturer. 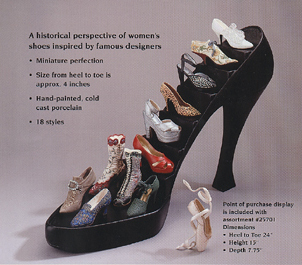 The concept involved creating miniature replicas of women's shoe designs from the 17th century to contemporary fashion. Raine would be the sculptor and fabricator of the prototypes, as well as creator of original designs. Joe Walsmith, president of Willitts, after consulting with his design and marketing staff, recognized the merits of Raine's idea and artistic ability. Joe expressed a desire to enter into a design agreement with Raine. As is often the case, the artist's emotions presented a challenge to negotiating a deal that was acceptable to both parties. Agent Andy was called upon to handle the business arrangement. Despite the fact that both parties wanted to pull out of the license agreement negotiations, on more than one occasion, Andrew managed to keep the ball rolling to a successful conclusion. The product line, known as Just The Right Shoe™ has produced over $250,000,000 in sales and more than 50,000 avid members have been registered to the JTRS Collectors Club. As a result of the success of JTRS, Raine was named Artist Of The Year by the National Association of Limited Edition Dealers in the year 2000; the line has received numerous industry awards; and, with Andrew's help, his client has become a millionaire from royalty income. "Without Agent Andy at the negotiating table, we would never have managed to close the deal on one of our industry's hottest product lines." - Joe Walsmith, Chairman, Willitts Designs, Ltd.